As promised, here's some eye candy made from those demo samples I prepared at the Scrapbook Expo. This first one is for everyone celebrating Father's Day this weekend looking for a really quick card for the Dad in your life. Here in Australia (and New Zealand for that fact) we don't celebrate Father's Day until the first Sunday in September so I'm feeling a little bit organised with a card made so many months in advance! I've used an image from Stamp-Its County Life 9up by Rachel Greig. This sheet has 9 wonderful rustic images on it which are really well suited to male cards and they need very little embellishment. I used a sheet of Black Magic which I randomly sanded and then layered onto a sheet from the Vintage Collection. I sponged a bit of Vintage Photo Distress Ink on a length of printed twill to age the tape a little and then it only needed a few extra touches like the photo corners and studs to tie it all together. I die cut the letters using my favourite tool, the Cuttlebug and Harmony alphabet. I've got to say that the Cuttlebug is one of the best tools I've invested in! Here's another really quick card, this time using the Cuttlebug to emboss the background of a piece of Black Magic card. This is a really bold pattern and it sanded away very quickly. If you get a bit heavy handed you might tear away bits of it like I did, but luckily they were all hidden by other elements. I used another image from Rachel Greig - this time Floriade 9up. These great black and white images look terrific coloured with just a hint of chalk. 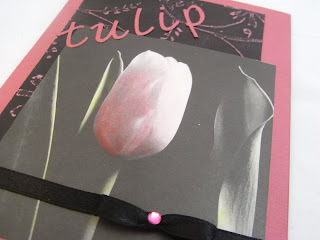 The ribbon is from my stash but I think it once adorned a gift and the colours suit the card perfectly. The red card front and the die cut letters are both from the Vintage Collection. 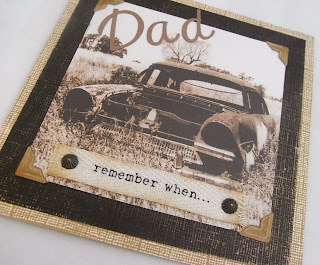 I just love the pre-distressed finished on this cardstock. This card is a variation of the Bloom card above. I've used another image from the Rachel Greig Floriade 9up coloured with chalk. I have lots more pieces of cardstock to make up yet, so check back later for more card samples and some different ideas on how to use Core'dinations. 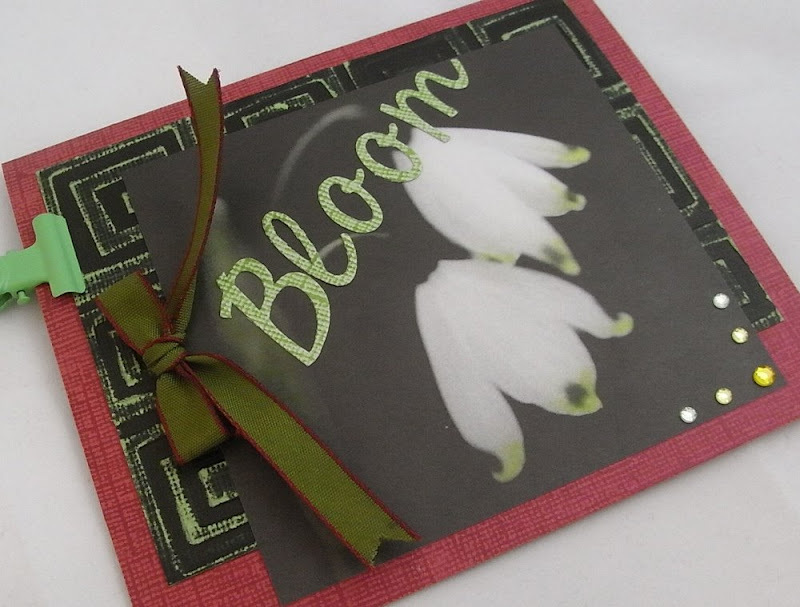 Hi Mylene, fantastic cards & as I said at the class on Friday, they inspired me to do something similar :) .